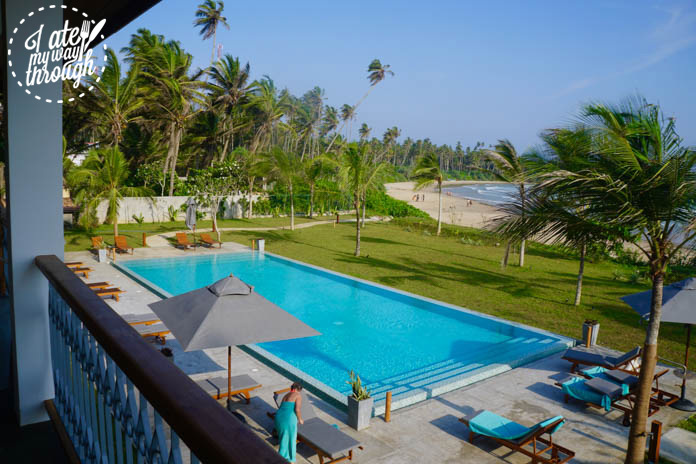 Where do I begin with 2 Villas Sri Lanka? 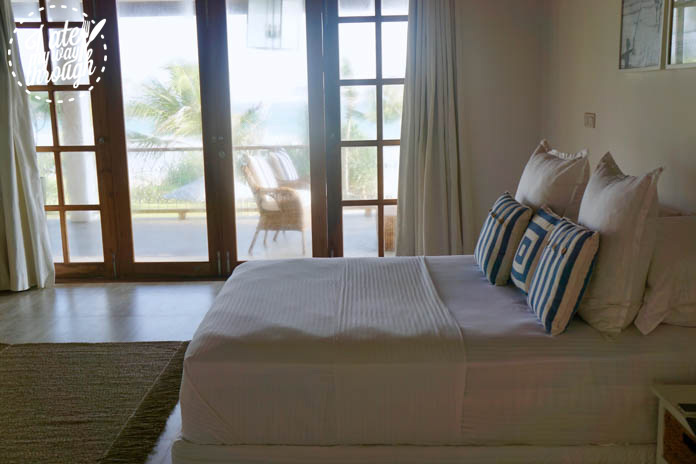 Imagine waking up to the sound of waves crashing against the shore, the soft rustle of palm trees tinkling in the wind, your head laying on a luxurious collection of extra soft down pillows and a slight glisten of sunlight streaming in through the double coated curtains. 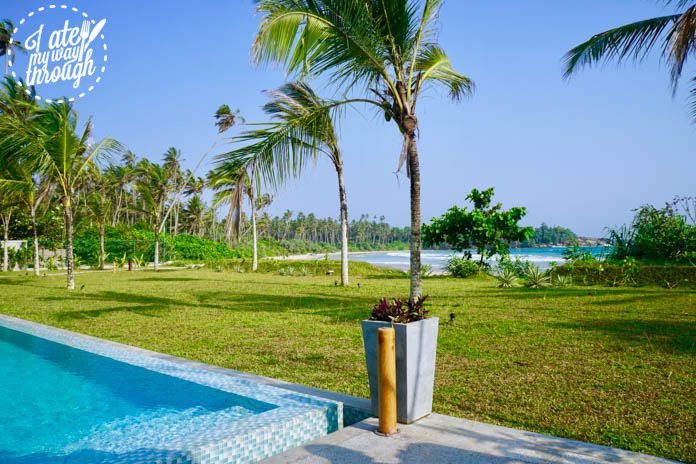 You walk outside from your bedroom and spot the amazing aquamarine water, powder soft sand and a bright blue pool begging for you to jump in, you so happily oblige. Oh, and just when you realise you forgot your towel, your personal butler Ash lays one of the deck chair ready for you, along with a morning cup of tea. Yes, welcome to paradise. For those who didn’t know, Sri Lanka is the world’s up and coming destination. 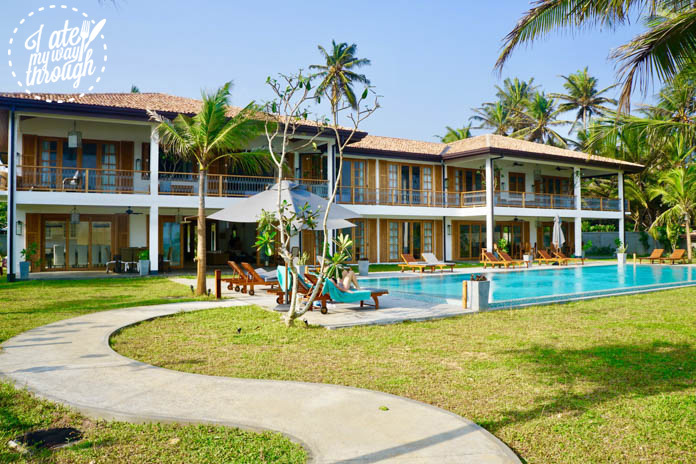 It boasts amazing beaches, warm-hearted people, colonial history, mouth-watering food, amazing wildlife and plenty of hotels to suit all budgets! 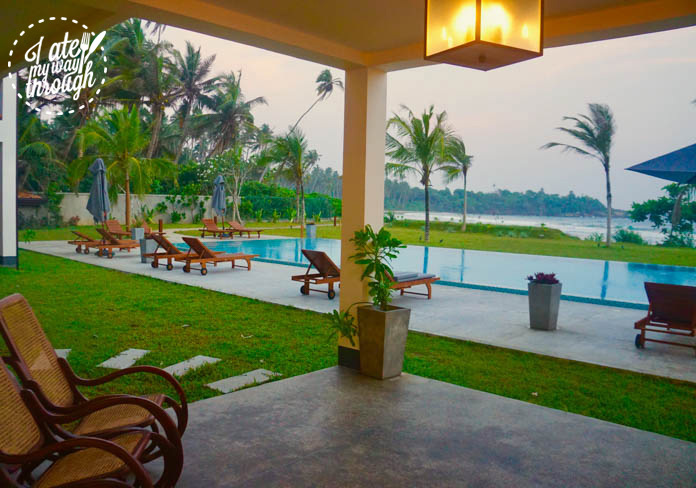 2 Villas Sri Lanka is the newly opened private villa and residence on the south coast of Sri Lanka in Dikwella Beach. 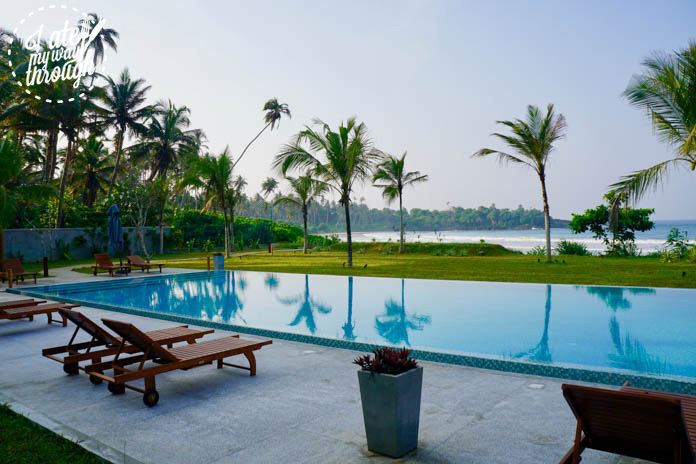 The south coast itself is buzzing with a huge number of hotels, restaurants, yoga retreats, cafes and private villas, which is constantly growing. Upon arrival, we are greeted by the ever kind Ash, our personal butler for our stay bearing 2 King Coconuts with straws to quench our thirst and cold hand towels to leave us feeling ultra-refreshed. 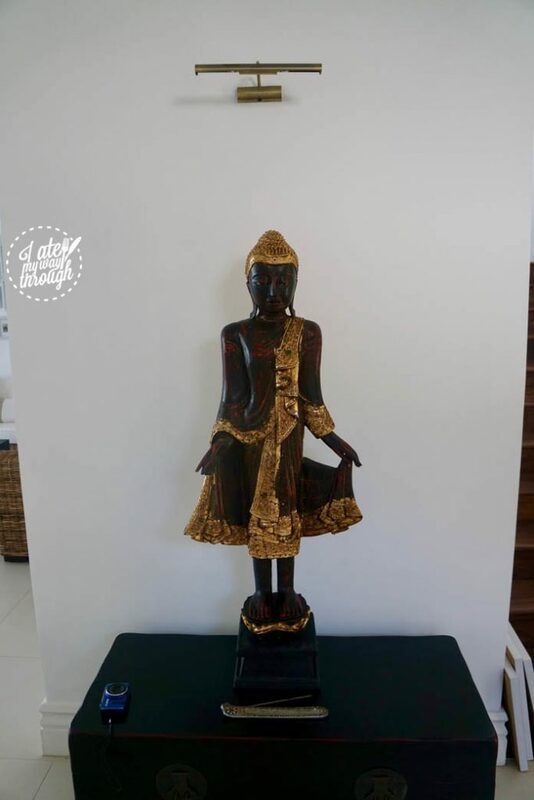 Sitting down on the plush white sofas, I took in the lush surrounds from the elaborate Buddha statue greeting us at the front door, to the extensive collection of antique maps, photographs, drawings and trinkets that owner Nicola has amassed over the years. 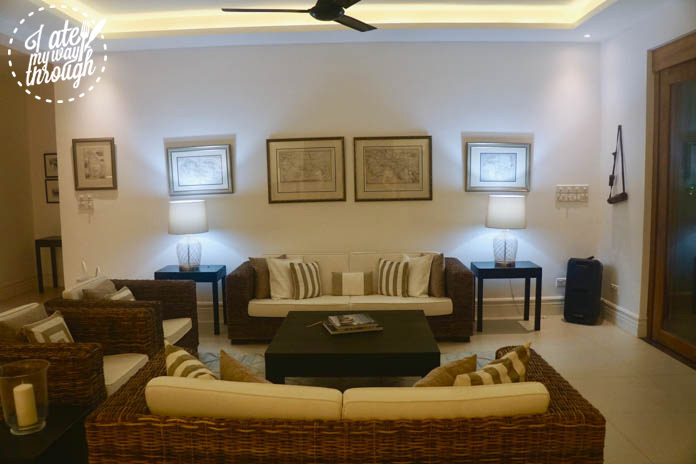 Every detail has been thought out and designed especially for the house, highlighting the dedication to the detail and high-quality finishes which resonates throughout the entire 2 Villas experience. What began as a passion project has morphed into a serious work of art and lengthy project, that has definitely paid off. 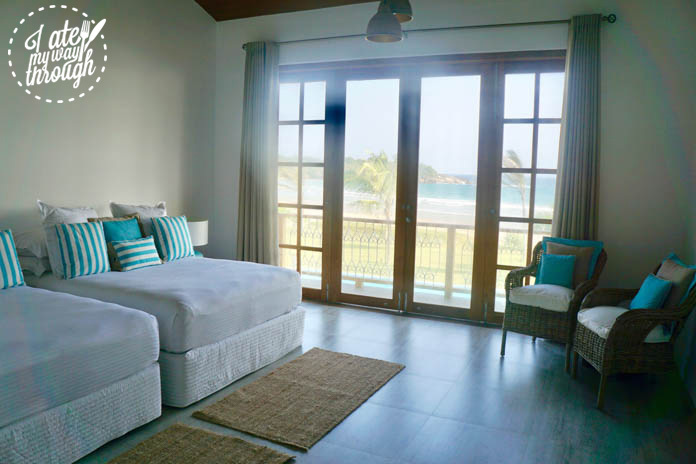 Located beneath one roof are two villas The Lookout and The Boathouse, with identical footprints yet individually styled. 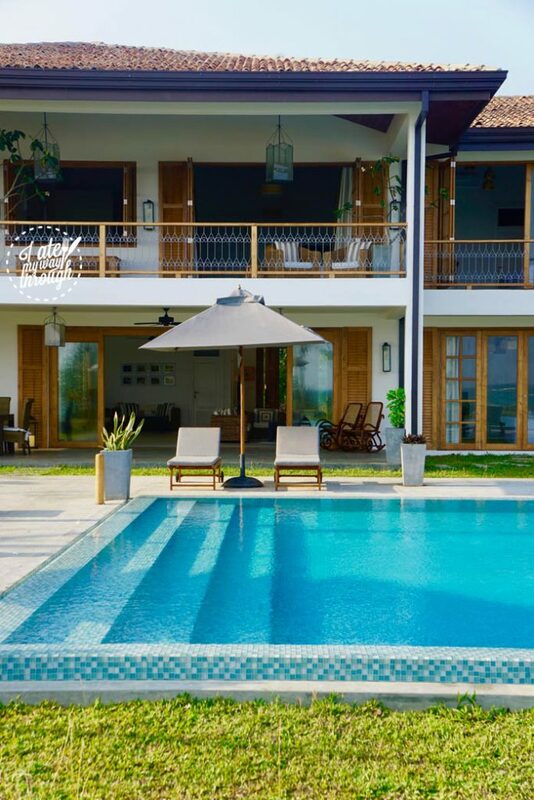 Together or apart, the villas can hold up to twelve each, and offers the perfect chance for a family getaway, yoga retreat, business meeting, friends holiday or even a wedding. 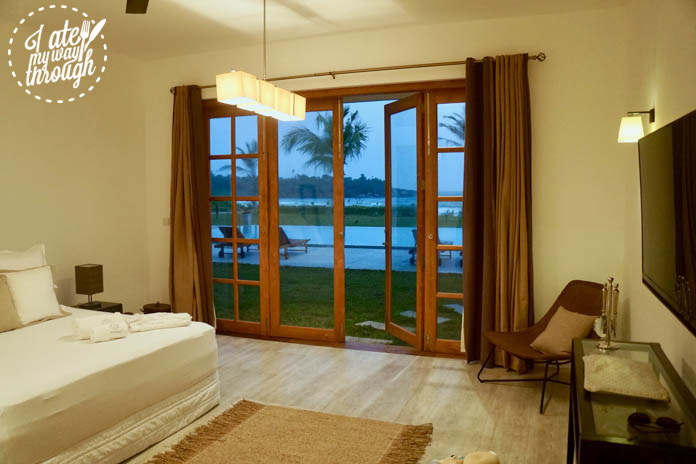 We were lucky enough to be the very first guests in the freshly opened The Lookout, showcasing the very best of what Sri Lanka has to offer for its visitors. 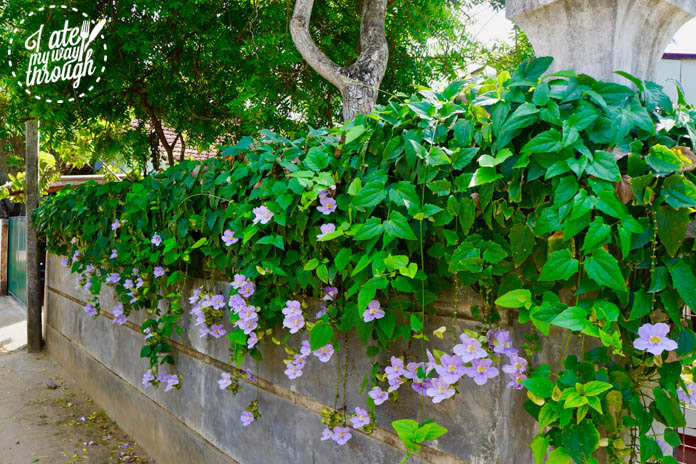 Down a narrow laneway lined with gorgeous lilac flowers and behind amber coloured timber gates sits the amazing beach front villa. 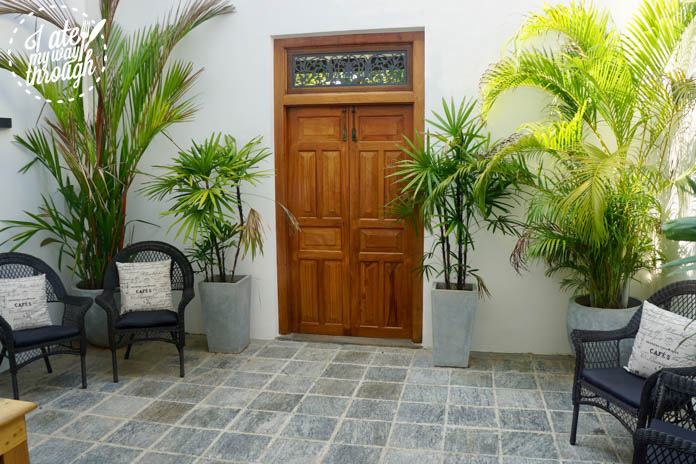 The garden is lush, with tropical plants, pretty frangipani flowers and an elegant front door. 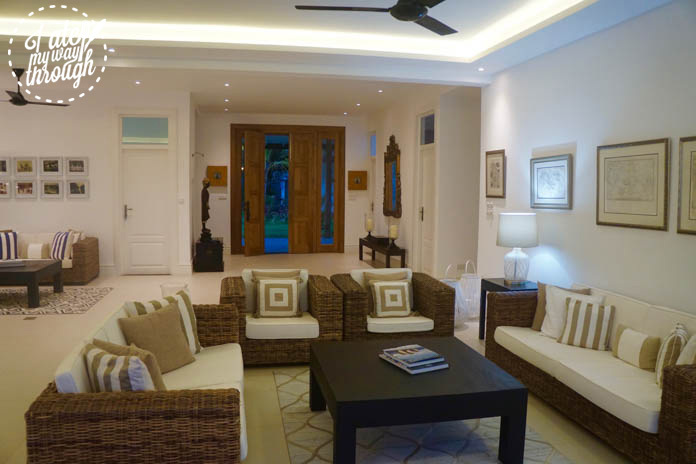 Walking in we enter a light and airy expanse, with an open plan living space styled with comfortable sofas, huge dining table and floor to ceiling sliding doors which lead out to the stunning azure pool and to the Indian ocean beyond. It is truly breathtaking. 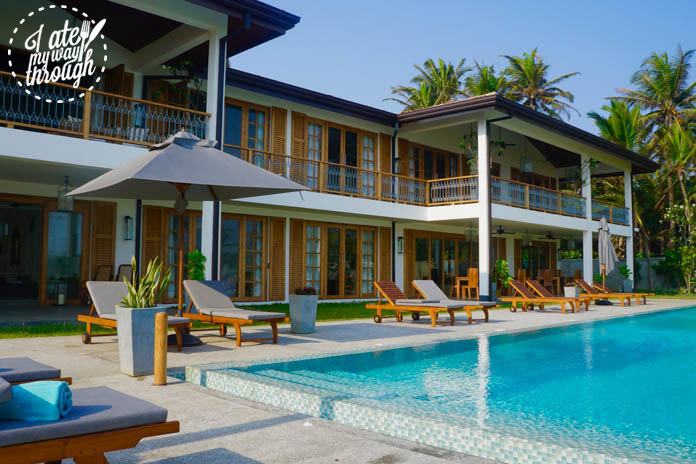 The fully staffed villa is designed with five star standards, service that will satisfy whatever need you may have, whether it be as simple as a glass of bubbles, the toothbrush you forgot or to guide you around the twice weekly fresh produce markets down the road. 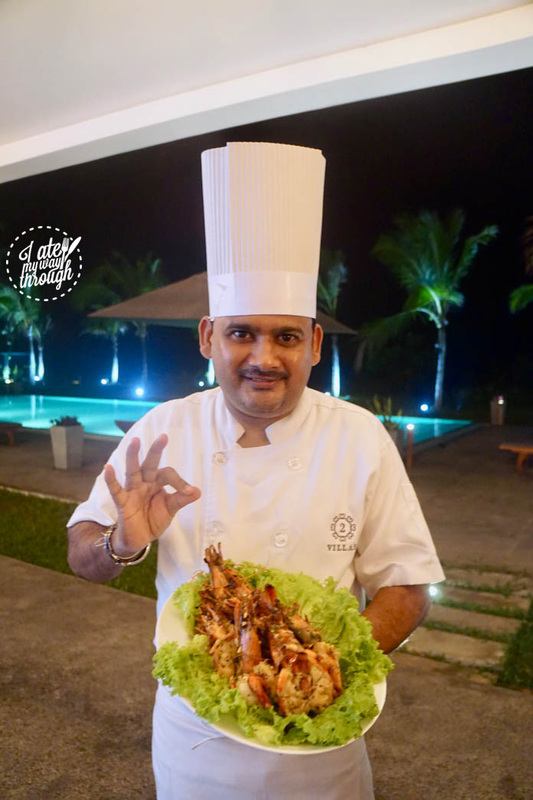 The chef caters to every dietary requirement and culinary desire. 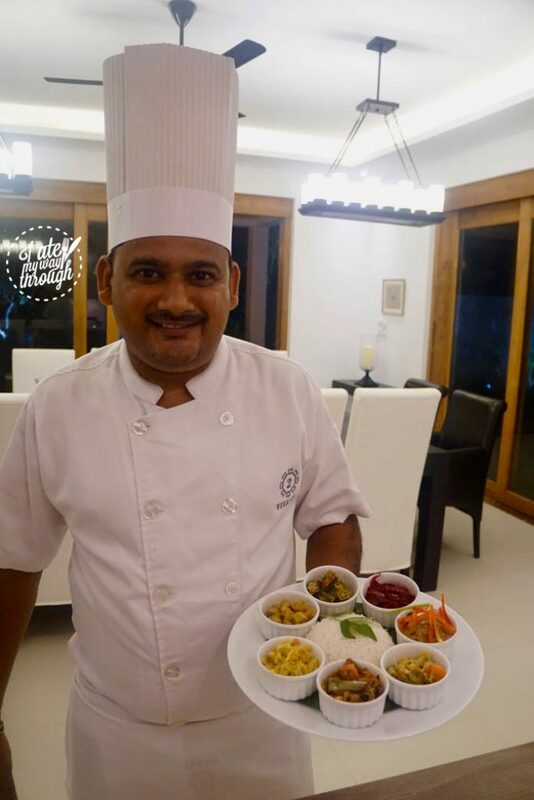 Hailing from the seven star Burj Al Arab in Dubai, his wealth of experience makes him a culinary master with number one priority of ensuring his guests are well-fed with some of the best cuisine, all whilst remaining in the comfort of their home. He will go to the markets daily (or for each meal if needed), and source whatever he can find for you and have it on your plate for dinner. We began our stay by settling into the gorgeous bedrooms. 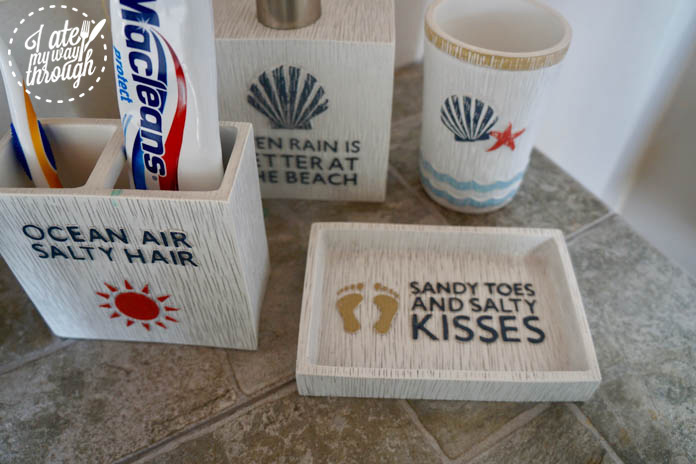 Instantly a beach house feel is emitted through the bedrooms. 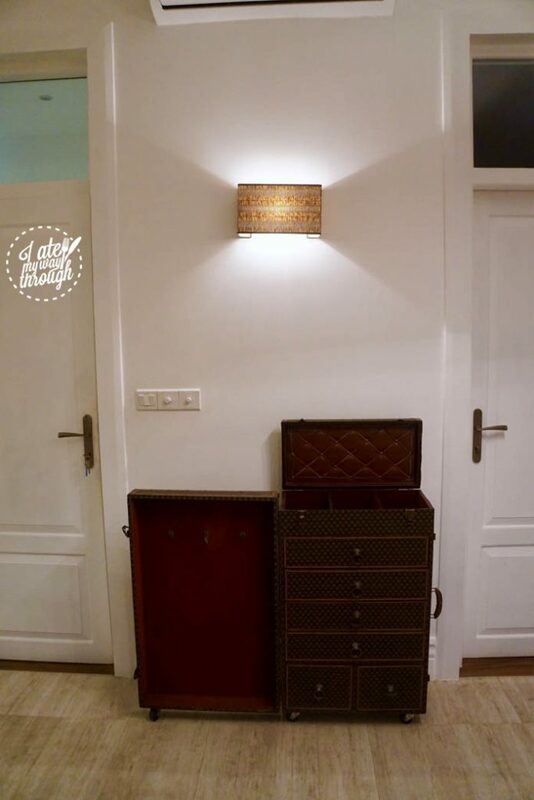 My bedroom was styled with vintage items such as an antique travel chest for storing clothes mixed with signature photography of contemporary Sri Lanka by up-and-coming British photographer James McDonald. 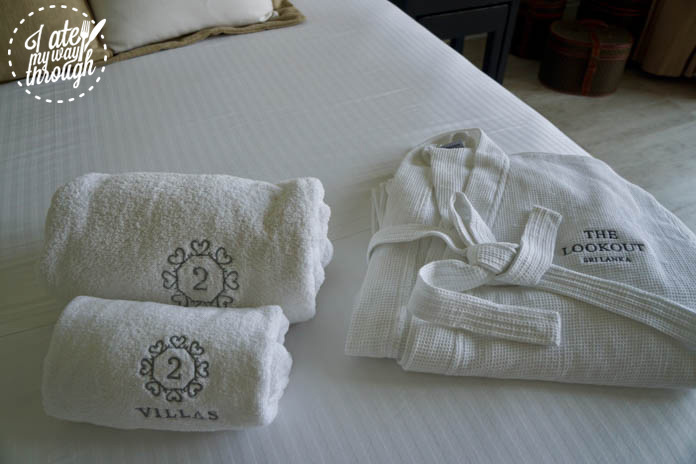 Each room has its own ensuite decked out with the villa’s personalised towels and robes. 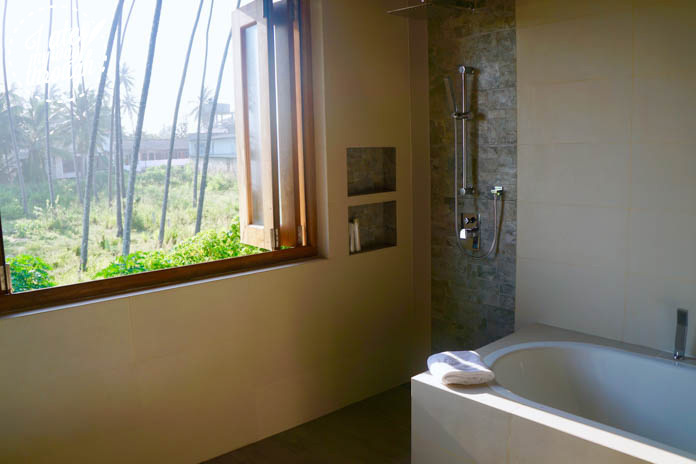 The bathrooms are impressive, large, spacious rooms with deep baths often with mesmerising outlooks onto palm trees or out over the garden and beachscape below. 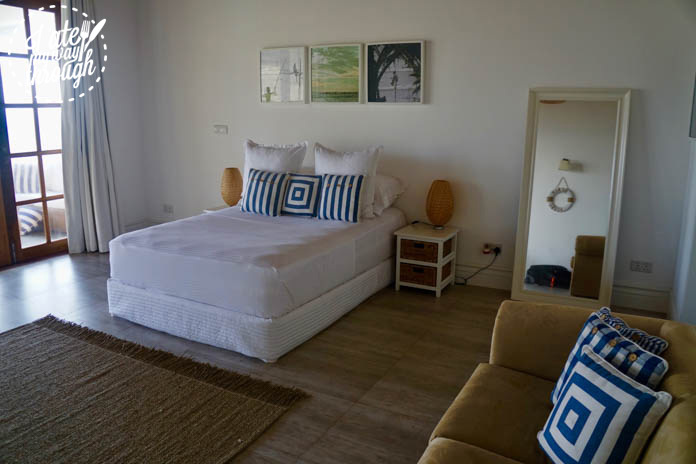 The three bedrooms upstairs open onto the large balcony with soft furnishings and tan coloured cane sofas perfect for relaxing, admiring the amazing beach views or taking some time out from the other action in the house. One bedroom boasts an entire room for its bathroom with a gigantic pool that looks over huge bay windows into a field of palm trees. How glorious is that?! 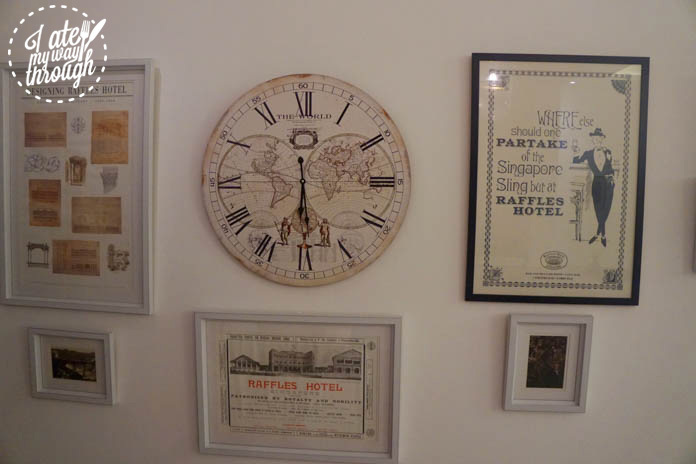 The Lookout is styled with photographs, ornaments and trinkets all handpicked by owner Nicola. 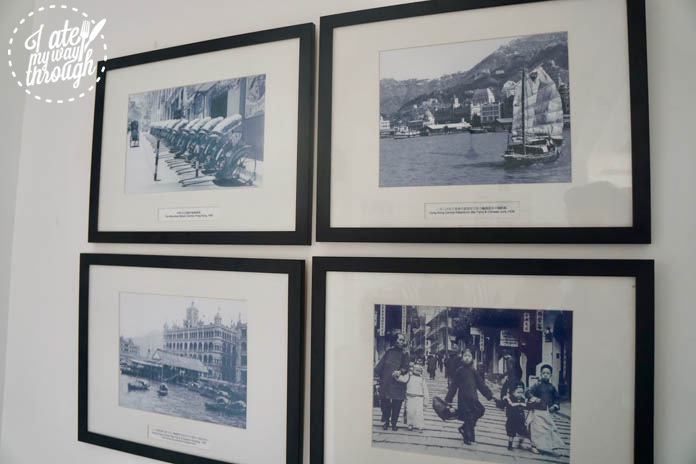 From the vintage maps of old world Ceylon and Asia, the Raffles Singapore posters, and the black & white photographs of historic Sri Lanka, down to the generations old binoculars which have been gifted to the house. 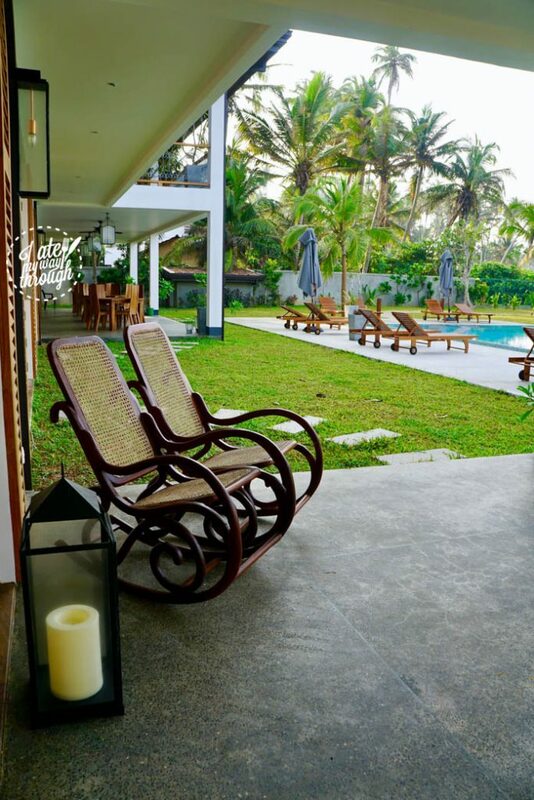 The most striking things about 2 Villas Sri Lanka lie in its luxury details. 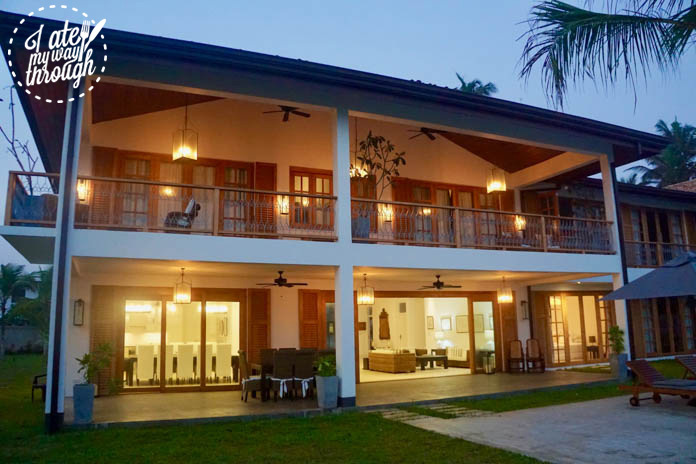 The house was built by two British couples who fell in love with Sri Lanka and wanted to share it with the world. 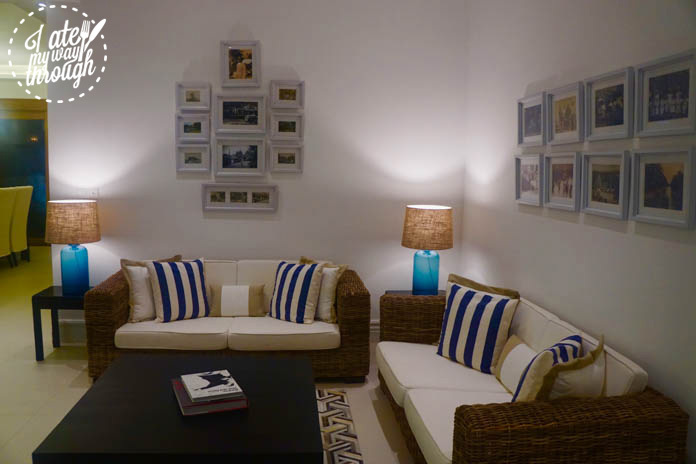 The residence is located in the smallish seaside town of Dikwella. As I sit here typing away on my laptop, my amazing butler Ash brings me a refreshing glass of sangria to quench my thirst. Meanwhile last night, the chef was instructed to create three curries, but instead did six. These are just a few examples of how the staff go above and beyond to make you happy, ensuring your vacation is an unforgettable experience. We heard about a nearby beach named Hiriketiya Beach only a short fifteen-minute walk over the hill. This proved to be one of the highlights of our time in Dikwella. Guided by Ash, the walk or tuk tuk ride, is picturesque featuring palm trees, flowers, and lush greenery. The beach was breathtakingly beautiful. By the time we arrived we had built up a sweat in the midday sunshine and instantly jumped in. The ocean was a magnificent sparkling blue, lined with cute little beach huts selling snacks, thirst quenchers and providing surf board renting facilities. Swimmers and surfers frolicked in the water whilst families dotted the shore. 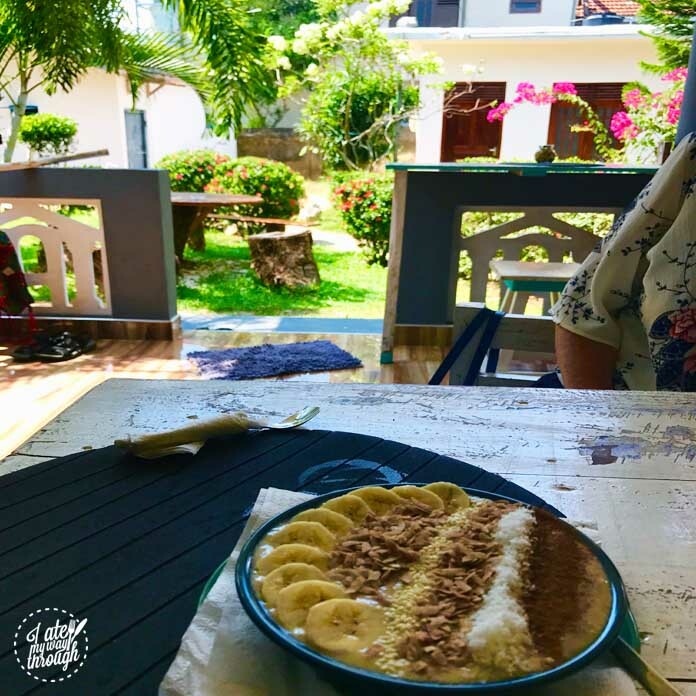 A lovely Czech girl has started a café Aloha Coffee Gallery in nearby bustling beach town Mirssa, serving some of the best coffee on the South Coast. It also has delicious smoothie bowls & healthy goodies. 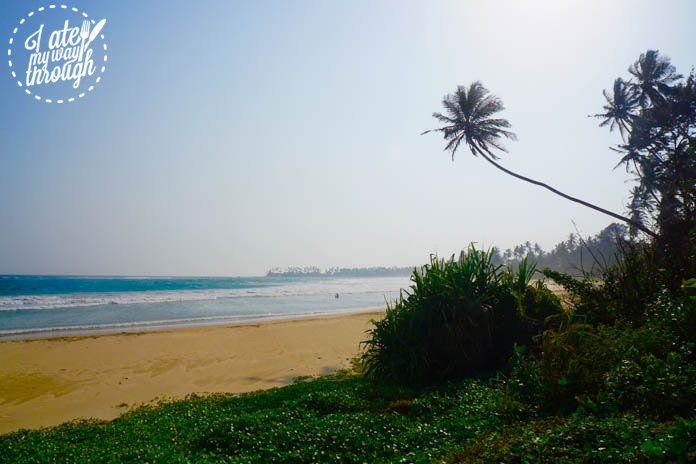 As a newfound local, she testifies that this beach is one of her favourite in Sri Lanka. 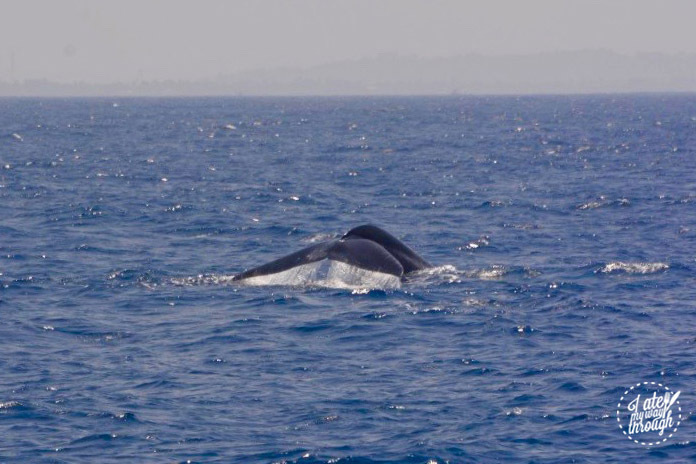 Mirssa is also closely located to Dikwella and is the whale watching capital of Sri Lanka. I highly recommend taking a whale watching trip to see some jaw-dropping blue whales, and watch as the boat glides alongside hundreds of dolphins in a truly magical experience that brought the biggest smile to my face. 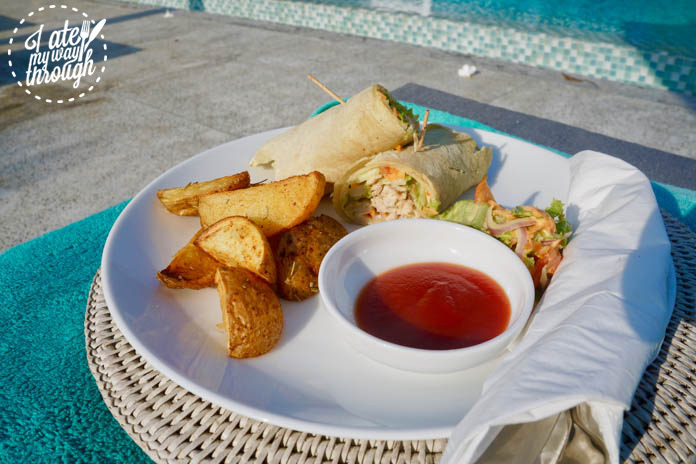 For a casual snack by the pool, the chef will make you anything your heart, or rather tastebuds desire. For a late lunch snack we enjoyed a juicy chicken wrap with potato wedges. When it comes time for some pre-dinner drinks, Ash the butler has been trained to make cocktails or alternatively can pour you some refreshing bubbles to enjoy by the pool. 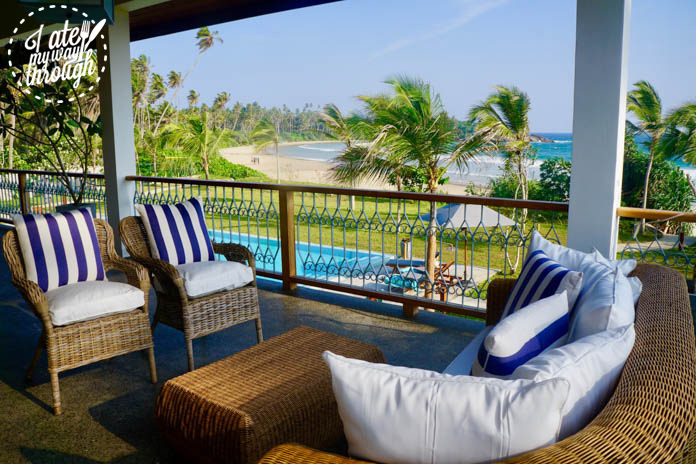 No crisps are to be found here, instead you will be served some of the finest local Sri Lankan snacks. 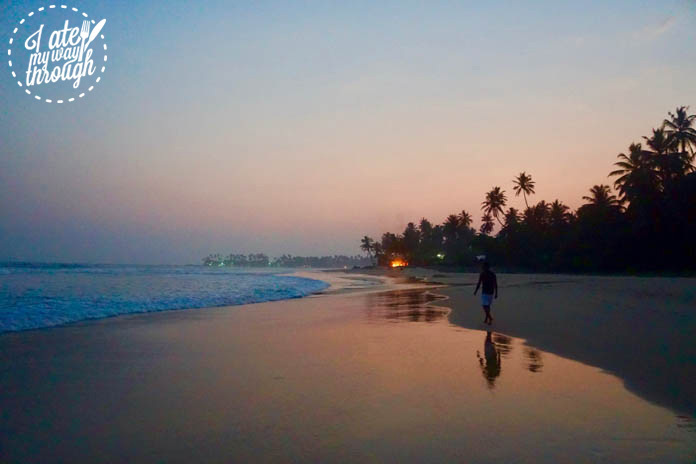 Before dinner, we enjoyed a leisurely walk along Dikwella Beach, with the gentle sound of the waves crashing against the shoreline and the light breeze tickling our skin. Dusk fell and a bonfire illuminated the beach, guiding us as we wandered home in time for dinner. On our first night at The Lookout, we were treated to traditional Sri Lankan fare with seven little bowls filled with some of the freshest most flavoursome curries I’d ever enjoyed. Each burst with flavour, and warmth from a slight touch of chilli. 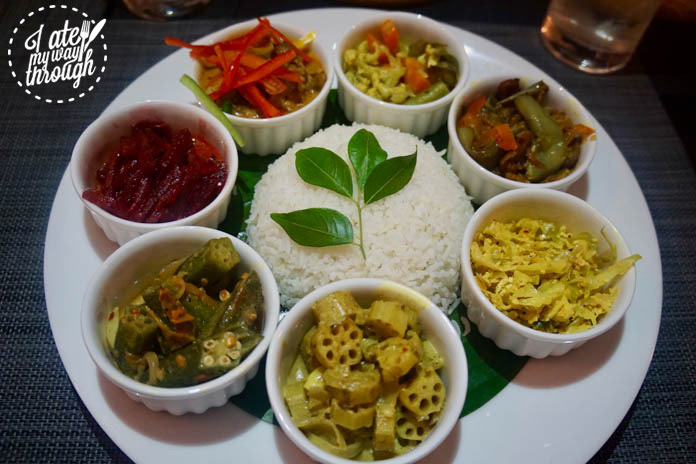 Vegetables and coconut are the forefront of Sri Lankan curries as we came to learn, and the many different ways that they are used to create amazing dishes will blow your mind. 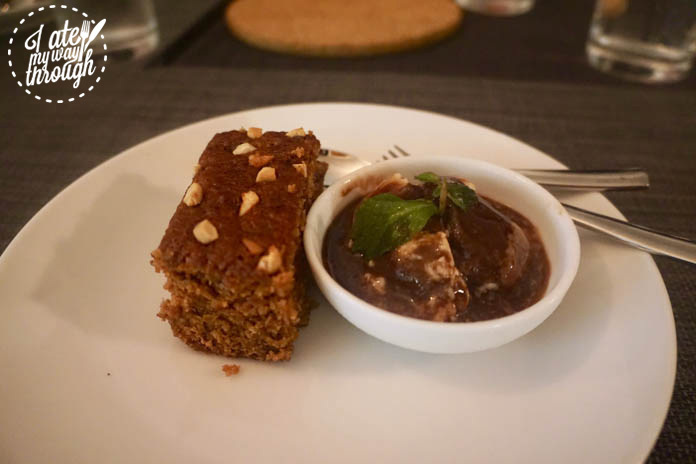 Despite being full, the chef insisted on dessert of a sticky traditional Sri Lankan cake with creamy ice-cream and rich chocolate sauce. The next morning, we began our day on the patio by the calming aquamarine of the pool with palm tree reflections dancing off the still water. 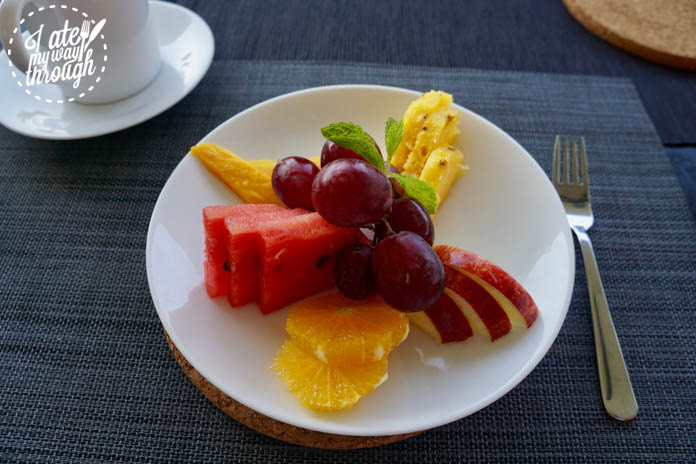 Everyday started with a simple yet delectable plate of fruit salad. Fruit is bountiful in Sri Lanka, available fresh everywhere, it is home grown meaning it is also basically all organic. Eating alfresco style for every meal, fruit became a ritual for beginning each day. 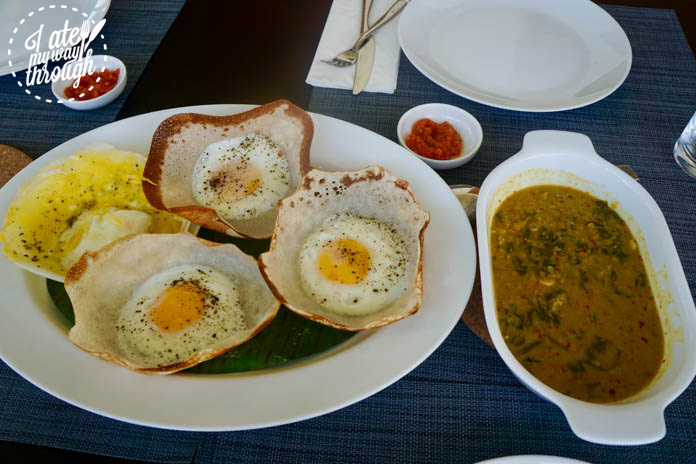 The simply unmissable Sri Lankan food item to try is the local breakfast food of ‘hoppers’. The delectable items are comparable to a thin crepe with a soft texture and slight crisp, made in an oval deep pan with a unique mixture that remains light yet filling. Usually an egg is dropped inside and cooked lightly so that the yolk remains runny. It is accompanied by curry such as fish, chicken or dahl and some coconut sambal. 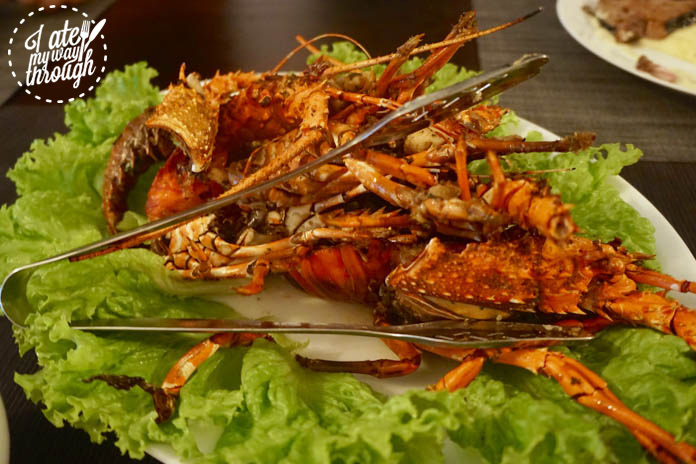 It went down a treat and is a notable part of Sri Lankan culture that you must ensure you enjoy. At lunch we opted to eat light. Chef made us some of his secret recipe tandoori chicken skewers, which were so good they had me begging for the recipe. 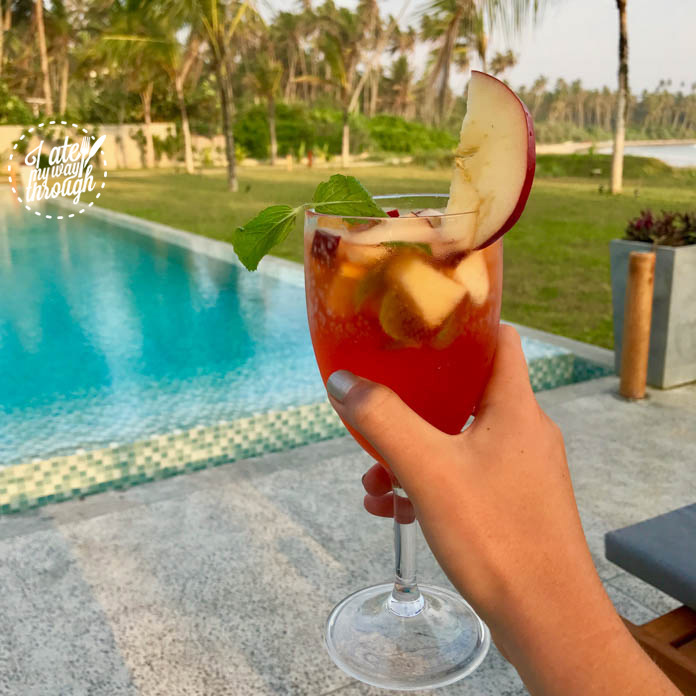 Come sunset, Ash made us a tropical cocktail filled with plenty of goodies, to sip in the pool and enjoy as the sun sunk down on the horizon. Dinner was a seafood feast and was absolutely remarkable! Chef had been instructed to go to the market and grab some fresh fish, which ending up providing enough to feed a small village. 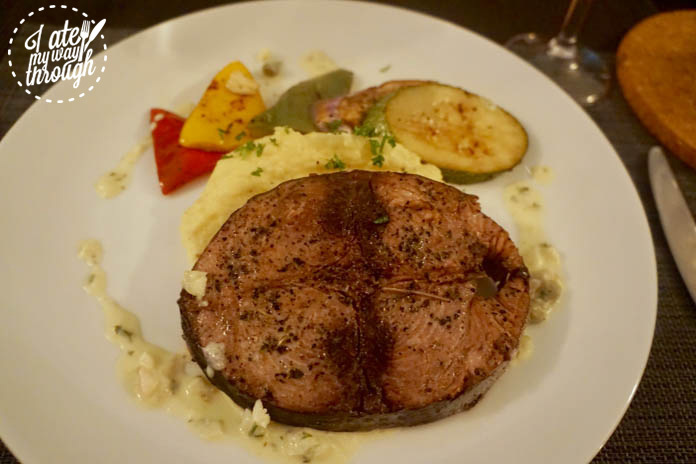 Tuna steaks with grilled vegetables were served to each guest, but then for the centrepiece of the meal. Lobsters and butterflied prawns with juicy, tender and amazingly delectable, undoubtedly having been caught fresh by the village fisherman that morning. I had told Ash that I loved vegetables and he had accordingly gone above and beyond, provided three generous sides of buttered green beans, sautéed spinach and grilled vegetables. I didn’t want to let any of the glorious seafood go to waste, but I simply could not fit another bite in! 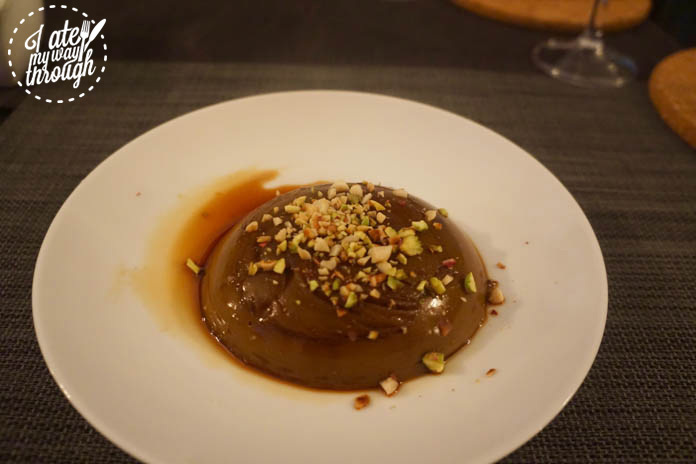 Dessert was a chocolate custard flan, served slightly warm with a syrupy caramel sauce and crowned with pistachio nuts. It went down a treat, and we really did go to bed in a food coma! The next day I was so sad to bid farewell to the amazing faces at The Lookout Dikwella. From Ash’s hospitality to our funny chef and his amazing culinary skills to our hostess Nicola. 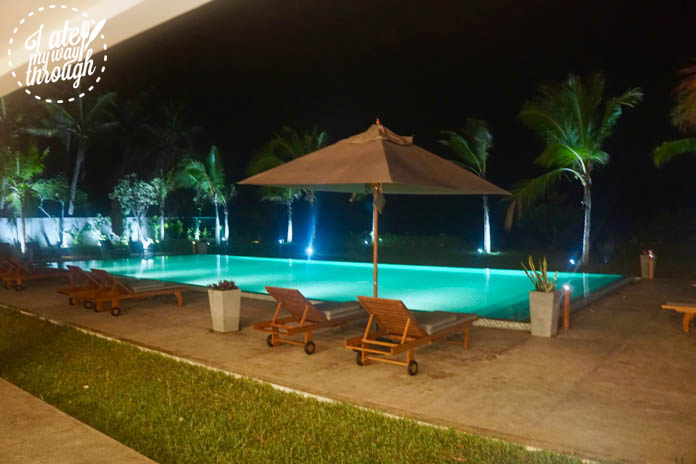 The dazzling azure waters of the pool, with the light crashing of the ocean against the waves just beyond our doorstep. 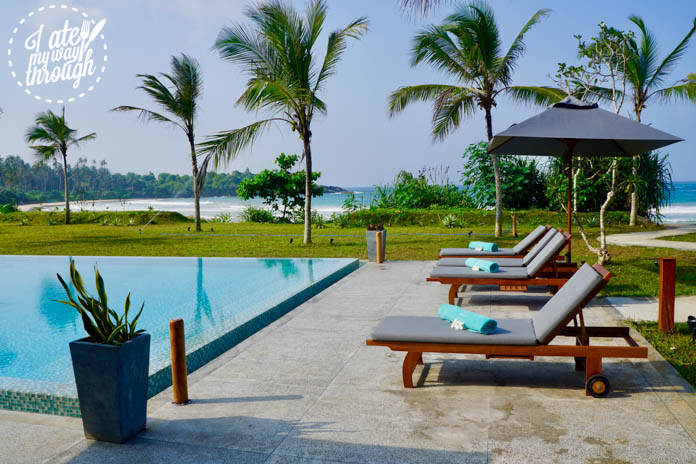 This is an unbeatable location for any type of holiday and the best way to enjoy Sri Lanka!